This is another post from my old blog that I'm sharing - Faux Sushi! It was for a campaign I did with FruitaBu, but you can really use any type of fruit rolls. They turned out to be so much fun to both make and eat! The boys helped putting the fish and licorice on and in the "sushi," and they couldn't wait to eat them! In a small saucepan, melt the marshmallows with the butter over low heat. Stir in the rice cereal until coated. Pour the mixture into a greased pan, flatten, and cut into small rectangles, or mold into rolls. 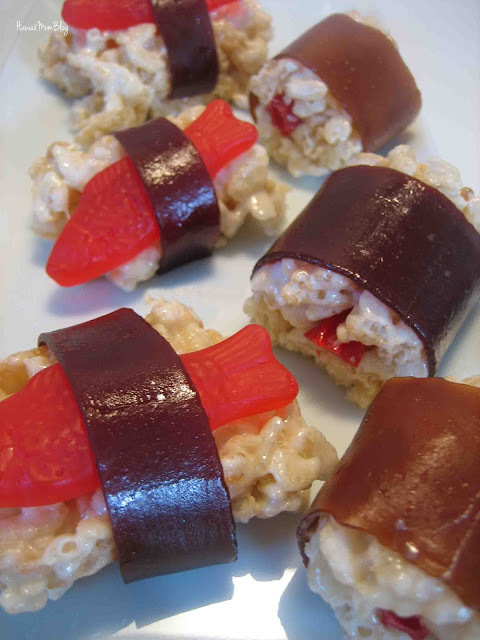 Get creative to make the "sushi" - add Swedish fish on top or licorice in the center, wrapping each piece with slices of fruit rolls to act as the seaweed.